Note: Movies can only be used in one set at a time. To use movies in more than one collection requires a different method using Tags. See: video library tags. The following are the available settings to control Movie Sets. The Movie Set Node is accessed from the Movies Home Screen. Along the top row of Categories, the icon Sets will become visible when the library contains Movie Sets. Selecting the Sets icon will open the Movie Sets node. As long as Movie Set metadata has been scraped, then the Movie Set node will be automatically populated. The only available settings when using the Movie Sets Node are those that are accessed by the Sidebar Menu. Description: When enabled, movies that are tagged with a "Movie set" are grouped together under one entry in the movie library. This entry can then be opened to display the individual movies. When disabled, each movie will have its own entry in the movie library, even if it belongs to a set. It has no affect on the Movie Sets node. Description: When enabled, a "Movie set" entry is used even if the movie set contains only a single movie from that set. When disabled, a "Movie set" entry is used only if the movie library contains more than one movie from the set. It has no affect on the Movie Sets node. The following methods are available for creating and editing Movie Sets. You cannot use the Scraper method to edit movie sets. Each movie required in a Movie Set must have Movie Set metadata. Using the native Kodi scraper will automatically download Movie Set metadata and create the Movie Set. Kodi relies on the scraper site for this information. The naming of the set, and the movies contained within the set, is controlled by the scraper site. These variables can be edited using one of the following two methods. 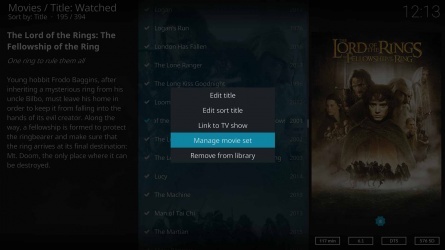 Kodi has an inbuilt Movie Set Editor which can be used to create and edit Movie Sets. The following guide and images should assist in locating and using the Editor. The Editor cannot be accessed from Videos>Files. It must be accessed from the Movie Library. Movies must have already been scraped into the library. Note: Ensure you have enabled the setting Include sets containing a single movie otherwise sets with a single movie will not be listed in the Movie Set Editor shown in Image 3 above. This setting can be enabled without enabling the parent setting Show movie sets. No set- The first option from the list. Allows you to remove an existing movie from a movie set. Add movie to a new collection - This is the button above the Cancel button. The button name is not fully visible due to the length of the button name. Pressing this button calls up the on-screen keyboard which allows you to type the name of the new Movie Set. Selecting Enter will then create the Movie Set and place the currently selected movie into the new Set. Additional movies can be placed into the new Movie Collection by repeating steps 1, 2, 3 and 4.3. Select each movie to be added or removed from the set. A selected movie will be in green coloured font. Using nfo files allows you to add Movie Set data to specific movies and then scrape into the library. <name></name>- The name of the Set. Must be identical for each movie nfo you intend to place into the Set otherwise multiple, similarly named, Movie Sets will be created. <overview></overview> - Allows the entry of a Movie Set synopsis. Requires a compatible skin to display the overview. As of 7 January 2018, the scrapers were modified to scrape Movie Set Overview. The code is entered into the nfo file as follows. It was possible to add Movie Set Overview information to Sets with the use of NFO Files. As of January 2018, TheMovieDB scraper was updated to enable scraping of Movie Set Overviews. These are a short synopsis of the Set as a whole. Most skins will display the Overview information. But, as this is a recently added feature, some skins may have glitches with displaying the overview. Most commonly because it overlays other information. The skin developers are rectifying these issues as they are reported. Many enthusiasts prefer to sort their Sets by Canonical Order. This is a sort order based on the story timeline. This means that prequel movies, made after the original movie, would come first in the sort order. An example of this is combining The Hobbit and The Lord of the Rings into one set. Although Kodi has no Canonical Order option, it is possible to force this order by adding a Sort Title to the movie entry. See image to the right which shows Canonical Order of the movies, whereas the first image at the top of the page in 1 Description shows normal alphabetical listing. Be aware that using Sort Order will also affect the Title sort order in the main library view. In most cases, this is preferable. The Sort Title is NOT displayed in any movie list. It is a hidden title used internally by Kodi. The following table shows a Sort Title renaming using The Hobbit and The Lord of the Rings as an example. Only use suffix numbering. Using prefix numbering will send all movies with prefix numbering to the top of the Library View list. The following are the two methods that enable adding Sort Titles to movies. 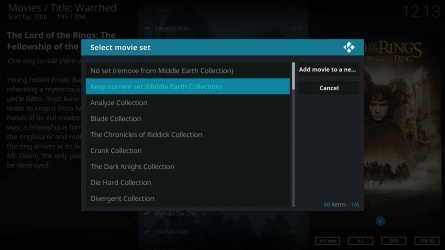 Kodi has an inbuilt Sort Order Editor. The following guide and images should assist in locating and using the Editor. The Editor cannot be accessed from Videos>Files. It must be accessed from the Movie Library. Movies must have already been scraped into the library. Using nfo files allows you to add a Sort title to specific movies and then scrape into the library. v18 is currently being modified to enable the scraping of Movie Set Artwork, similar to the scraping of regular Fanart and Posters. Core changes are required for this feature. As of February 2018, those changes have not yet commenced so it is not yet available in the nightlies. This page was last edited on 3 January 2019, at 07:15.